​The Social Justice Committee, with Fr. Paul’s support, invites all members of our Parish to promote Global Solidarity by spending just two hours packing meals for hungry children in partnership with Kids Against Hunger. Every 6 seconds a child dies, nearly 16,000 every day, because of hunger and related causes. Did you know that 15.3 million children under the age of 18 in the United States live in households where they are unable to consistently access enough nutritious food necessary for a healthy life? Kids Against Hunger is a non-profit organization with a mission to provide nutritious food to impoverished children and families around the world...and around the corner. They organize meal-packing events where volunteers assemble meals for hungry and starving children all over the world. Visit https://kahbayarea.org/ for more information. ​Join us to provide meals to hungry families around the world by volunteering just two hours of your time. Stay for the BBQ! 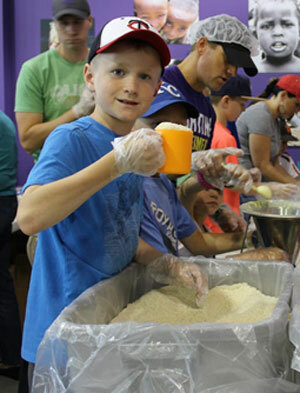 What: Spend just two hours helping to pack meals for hungry children. Why: Jesus said “Truly I tell you, whatever you did for one of the least of these brothers and sisters of mine, you did for me." When & Where: 10:00 a.m. Saturday August 25th, 2018 at St. Augustine Hall. Who: Adults and children 8 years and older. Donations are welcome but optional when signing up. Our goal is to have 150 volunteers. So invite your family and friends and stay for the BBQ at the end! For more information contact Lisa Schibler at lschibler13@gmail.com or phone 925-989-6282.